An Indonesian court has found the palm oil company PT Kallista Alam guilty of illegally burning large swathes of the Tripa peat forest, which lies within Sumatra’s Leuser Ecosystem, the only place on Earth where tigers, elephants, rhinos, and orangutans can be found living together in the wild. The court ordered the company to pay 114.3 billion rupiah (US$9.4 million) in compensation and 251.7 billion rupiah (US$20.8 million) to restore the affected areas of forest. The case was brought against PT Kallista Alam by the Indonesian Ministry of Environment. “This is a clear message to companies working in Aceh who think they can destroy protected forests and get away with it,” said Muhammad Nur, chairman of the Aceh branch of the nonprofit group Walhi, or Friends of the Earth Indonesia. The senior judge at the Meulaboh District Court, Rahmawati SH, said PT Kallista Alam had illegally used fire to clear forest land and was in breach of National Law N° 32/2009 on Environmental Protection and Management. The court also ordered the confiscation of 5,769 hectares of land managed by PT Kallista Alam and set a 5 million rupiah (US$423) daily fine for each day the company delays paying the compensation and restoration costs. PT Kallista Alam will appeal against Wednesday’s ruling. The Tripa swamp forest is a last bastion for orangutans and is home to many other endangered species. Walhi said that the groundbreaking verdict is the result of just one of several civil and criminal prosecutions underway against PT Kallista Alam and four other oil palm companies with concessions in Tripa, namely PT Surya Panen Subur II, PT Dua Perkasa Lestari, PT Gelora Sawita Makmur, and PT Cemerlang Abadi. “Each faces the possibility of serious financial consequences as a result of their illegal clearance, burning, and drainage of Tripa’s unique peat swamp ecosystem. Some of the company directors and members of senior management also risk prison terms in cases against them for their actions on the ground,” said Walhi. There are only about 6,500 orangutans remaining in Sumatra, and one of the densest populations is in Tripa. 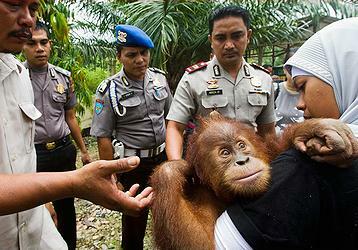 Orphaned orangutan rescued near Tripa in 2012. (Photo by Paul Hilton/ SOCP/YEL). There were some 2,000 to 3,000 orangutans in the area in the 1990s, but only a few hundred are left today. Orangutans are not the only animals in jeopardy as the Tripa swamp is slashed and burned; the area has also been home to Sumatran tigers, Malayan sun bears and other endangered and protected wildlife. “Orangutan densities can reach as high as eight per square kilometre in these areas, compared to an average of around only one or two per square kilometre in dryland forests,” he said. The judges heard evidence about how much damage the forest burning had caused to the soil structure in Tripa; peat layers 10 to 15 centimetres deep were destroyed. Gases triggered by the burning exceeded the permitted Threshold Limit Value. In August 2011, the then governor of Aceh province, Irwandi Yusuf, granted PT Kallista Alam a permit to develop a 1,605-hectare oil palm plantation in the heart of Tripa. After a large-scale international protest, the Indonesian environment ministry decided to investigate the issuance of the permit. In September 2012, Governor Zaini Abdullah revoked the permit in accordance with a ruling by the Administrative High Court in Medan, which said the license was illegal. PT Kallista Alam appealed and, in May 2013, the Banda Aceh Administrative Court ruled in the company’s favor and overturned the revoking of the permit, saying that it was not legally binding because the court decision was being challenged in the Supreme Court. PT Kallista Alam’s Supreme Court appeal has since been rejected in a ruling that supercedes that of the Banda Aceh court. More than 1.5 million people have signed online petitions calling for greater protection of Aceh’s forests, currently under enormous threat because of a controversial new spatial planning law passed by Aceh’s parliament on December 27. These petitions are supported by some of the world’s leading scientists and conservation experts, who have written to Zaini Abdullah, urging him to nominate the Leuser Ecosystem as a World Heritage Site and thus protect its unique biodiversity. Muhammad Nur said that Aceh’s parliament is pushing the new spatial plan, which they recently legalized with a new Provincial Government Regulation, known locally as the Qanun RTRW Aceh. “The Qanun completely ignores the protected status of the Leuser Ecosystem, and the intention is to open up large areas of protected forests for road building, mining, and palm oil and timber concessions,” said Nur, who heads the Aceh branch of Walhi. “This will, in effect, end Aceh’s chances for long-term sustainable development as it will cause further destruction of critical watersheds, leading to ever more frequent flash floods, landslides, and other environmental disasters,” he said. According to local media reports, the draft spatial plan has been submitted to the Ministry of Home Affairs for review. “Flash floods already kill hundreds in Aceh each year and floods and droughts have major impacts on agricultural production. Human deaths and economic losses to local communities will both increase dramatically if these developments are not stopped immediately,” Singleton warned. At least 2,800 hectares of the Tripa forest were devastated by fires in March 2012, and most of the hotspots occurred on the deepest peat. In just five days, there were no less than 87 fire hotspots in three of the oil palm concessions within Tripa – those owned by PT Kallista Alam, PT Surya Panen Subur II, and PT Dua Perkasa Alam. This was the highest intensity of fire hotspots recorded in a five-day period in Tripa since satellite monitoring of Indonesia’s fire hot spots began in late 2000. Conversion of the Tripa peat swamp into palm oil plantations will cause massive emissions of greenhouse gas and reduce buffering against flooding and drought. The area was hit by a devastating tsunami in December 2004 and needs all the protection it can get. Indonesia’s peatlands cover less than 0.1 percent of the Earth’s surface, but their destruction is causing four percent of global greenhouse gas emissions every year. According to Greenpeace, the annual clearing of Indonesia’s peatlands releases some 1.8 billion tonnes of greenhouse gases and some put the figure at two billion. Under Indonesian law, development on peat up to three meters (9.75 feet) deep is still legal, and the palm oil industry’s certification system, the Roundtable on Sustainable Palm Oil, does not ban all development on peat. The international demand for palm oil is massive. According to the global conservation organization WWF, about half the packaged food now found in supermarkets contains palm oil. It is present in all kinds of produce ranging from biscuits and peanut butter to chocolate and ice cream. It’s in all kinds of ready meals and breakfast cereals, and in shampoo, cosmetics, shaving cream, soap, and industrial lubricants. Between 1990 and 2005, Indonesia lost more than 28 million hectares of forest, including 21.7 hectares of virgin forest. 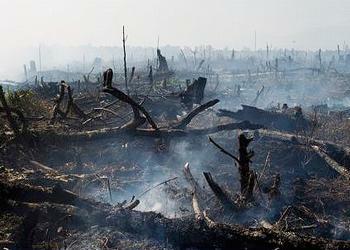 It is estimated that, from 2000 to 2010, about 1.125 million hectares were lost. Aceh has the most forest cover of any province on the Indonesian island of Sumatra, but has lost more than a third of its forests in the past 20 years. According to a report published in 2007 by the United Nations Environment Programme, palm oil plantations are currently the leading cause of rainforest destruction in Malaysia and Indonesia. 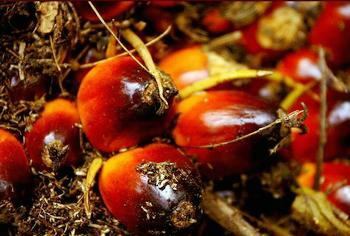 Close to 90 percent of the world’s palm oil is produced in Indonesia and Malaysia. Indonesia’s oil palm plantations already cover some nine million hectares and there are projections that 26 million hectares of the country could be covered by palm oil plantations by 2025. The country produces close to 27 million tonnes of palm oil a year, which is nearly 50 percent of the estimated global consumption of 58 million tons in 2013. The monetary gain is US$20 billion in export earnings. The Aceh branch of Walhi believes there is intense pressure on Governor Abdullah to allow the Leuser Ecosystem area to be used for oil palm cultivation. According to Walhi Aceh, five oil palm plantation companies have applied for permits to cultivate palm oil on sites within the Leuser Ecosystem, in East Aceh and Aceh Tamiang. There are statistics showing that 36,000 hectares of the ecosystem were deforested from 2005 to 2009. Data analysed by the Leuser Ecosystem Management Agency showed that, in early 2005, 1.982 million hectares of land in the ecosystem was covered by forest. 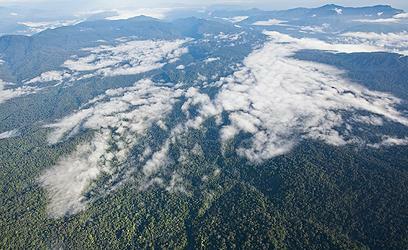 In 2009, there were 1.946 million hectares of forest left. It has been alleged that PT Kallista Alam started clearing the Tripa peat forest and planting oil palms well before their permit was issued. It has been stated in testimony during criminal proceedings that the company’s site permit expired in February 2011 and was not extended by the regent of Nagan Raya because the site in question is located within Leuser Ecosystem. The prosecutors say this means the company never had formal permission to clear the forest and should never have been granted a permit by Irwandi Yusuf. PT Kallista Alam has denied violating any environmental laws. It said it hadn’t caused any environmental destruction or pollution and called the environment ministry’s allegations obscure, unclear, and lacking in evidence. The company said there was no legal foundation for the ministry’s allegations about environmental damage. It challenged the validity of the data presented by the ministry and said any burning it carried out in the Tripa forest was done in line with regulations.